The weather has been getting a lot colder here lately so I thought I'd post up a weather-appropriate look to go with the season. I've been rushing a little more in the mornings lately to apply my makeup so I've been sticking with an easy and flattering neutral look most days. I've mentioned this before, but an easy way to mix up a neutral look is to have sort of an "accent" color. To get these waves I sleep on my hair wet from a shower the night before, then I twist my hair in two buns while I get ready for the day and take it down before I leave. Easy peasy. My outfit is fairly standard work-wear for me. I really love this dress from Forever 21. I can't get enough of chunky-knit details! Leggings of course, since it's been so cold. hopefully this isn't too off topic, but i'm planning to get target leggings cuz i remember you mentioning a while ago that they fit you really well. basically, i'm wondering which leggings you are wearing from target, and if you think the kid size would still fit me. sorry for the long post!! I really like this look, I think it really suits what you wore that day and also the mentality of being more comfortable/casual in fashion choices these days! Chunky clothes plus leggings is such a great combination on a petite figure like you! BTW. what type of job do you have? daisy: aww, thank you! I do recommend this combo. I don't use it a lot but it's a good balance for the "glowing from within" look! Let me know if you get it! You are sooo pretty! I have been following you for quite some time! :) I didn't have a blog for a long time, but I would visit your channel through your YouTube links. Your blog is so interesting! Congrats on 500 followers! You deserve even more! Great look. So natural but you sill look great. Thanks for the hair tip. Will definitely try it. Haha to the toilet bowl behind you. Great outfit too! Thanks for making this blog! It's been such a great help for me! btw how do u do your hair? Love the jacket! My sister does the same thing with her hair, but it seems to fall flat by midday. Anything you do to keep those waves pretty throughout the day? 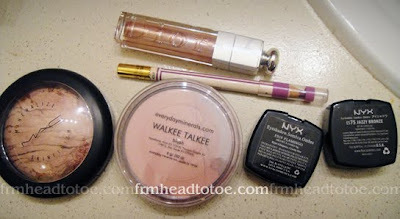 Love the makeup and that darling tunic from F21! I wish I could pull off a neutral blush so well. love the "bed head" hair! your hair is as long as mine was until i cut it a little past my shoulders today =D there was a pile of hair on the floor and it looked kinda gross. So pretty!! I love the gloss and overall look on you! Hello gorgeous! You have such a beautiful figure (and well everything else). Thank you for your earring idea! Honey Drops are so cute! I make a pieces worthy of such sweet name. ^_~ <3 ya! 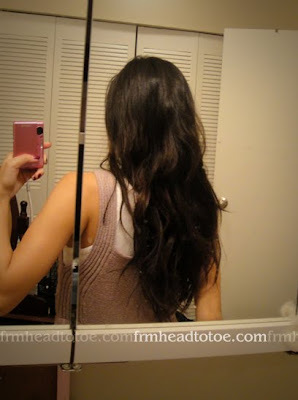 I used to do the same thing - wet my hair, tie it in a bun overnight and my hair was wavy and gorgeous the next morning. It does work, but I do need to warn you. Unfortunately, a lot of my hair started to fall off :( I had a bald spot in the area where the buns were - please do not do this. I hope I can keep my hair that long like yours. It will be awesome. When did you buy your dress? It's not on the website anymore. It's very cute. Thanks! Oh, and I got the dress about a year ago and unfortunately, styles change very quickly at F21! Kaye: I hate to use hairspray, but if you add some loose-hold or curling hairspray or gel to your hair before you twist it up, that can help to keep the curl. Sophie: ahhhh! I would probably cry if that were me. I've never had my hair above my armpits before. LOL. I hope it turned out really cute! Anonymous: Actually, I am so lazy about getting trims. I get a major haircut every 4-6 months with lots of layers and just let it grow out. If you keep the ends healthy, this helps to grow it out long vs getting frequent trims. DSK Steph: Haha! My first idea was dew drops but I saw that about 3 other people also thought of that too. PS, I am wearing the K-drama necklace today! LOVE it so much! that is such a cute blush combo. i'm really digging it. love the whole outfit and makeup look. congrats on hitting 500 followers! I have photos of my costume up on my blog! watching you is like watching an artpiece, beautiful!! There are many herbal remedies which can also be used for bright complexion and acne relief and many more cure. hey. the outfit matches your makeup. lovely and simple. thanks hun.